Club Penguin Cheats by Mimo777 Club Penguin Cheats by Mimo777: Club Penguin Pin Cheat - IGLOO PIN! Club Penguin Pin Cheat -IGLOO PIN! Here is how to find the new Club Penguin IGLOO PIN cheat. Step 3. Go into the manhole and to the Pool. Mimo, what server is your fav? ooh thats a cool pin! thanks mimo! I got the pin, thx Mimo! do you think that the igloo pin has something to do with the yeti or the blizzard wizard? because why would they have a igloo pin in the summer? also thanks for letting us know where the pin was....i couldnt find it!!! Sweet pin! I didn't even no there was a new one today. This is my favorite pin of all time! Hmm wierd. 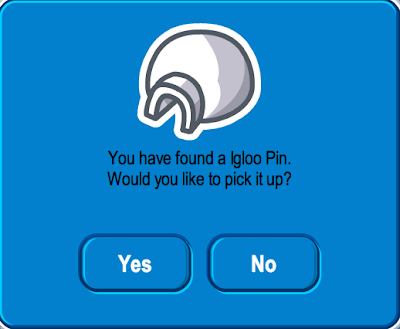 The igloo pin looks like its the first pin made in cp. Dont ya think peoples. Probably not. I think its for the new igllo update because now you can save your igloos. Have we had this pin before or is this new? :ooooooo smallest pin ive seen!even my 2008 pins are bigger than that!